For minor or major industrial roof repairs, we are a leader. Not all leaking roofs need to be replaced...Repair! The average life expectancy of a commercial flat roof in Canada is less than 15 years. No matter how properly installed, time, weather and debris lead to corrosion and any commercial roof will eventually have to undergo maintenance and flat roof repairs in due time. Flat roofs gather and holds debris because there is no steep slope for it to slide off of. Many commercial flat roofs even have specific weaknesses from their original roof design - areas around pipes, ventilation ducts, etc can often cause leaks. Flat roof leaks or moisture issues are more difficult to diagnose and repair than on a peaked roof. The staff at Roof Scan.ca have the knowledge, tools, technology and expertise to locate and stop any leak. When we perform a industrial roof repair we are not just applying a bandage that will only last 6 months, we completely eliminate the leak. 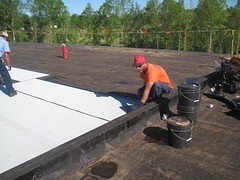 The earlier a commercial roof leak is detected the better, and with such high-quality techniques and practices used by us, you can be assured that your business and its roof are being protected by the best. What types of commercial roof repair can we do? We specialize in Built-Up (tar and gravel) Modified Bitumen (asphalt), EPDM (synthetic rubber) and PVC (rubber-like plastic). Perhaps you are not certain of the type of commercial roof you have? Give us a call, we can tell you! We serve the Toronto, Mississauga and GTA so we welcome any size of commercial roof repair. You will have one point of contact- RoofScan.ca! Documentation. We provide accurate records allowing for future planning and optimum resource allocation. Ethical business practices – at a reasonable price. We are not the “lowest bidder” type, nor are we the highest. We believe in quality. 24/7, 365 days a year emergency commercial roof repair service. We set our standards of quality, value and customer service to the highest degree. Your moisture areas will be pinpointed infrared technology ensuring resources are going exactly where they need to. 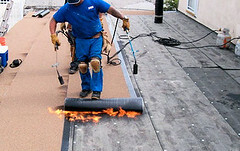 Only high-quality, lasting materials are brought to your roof. Superior commercial roofing materials are critical in the long-term long life of your commercial roof. Our commercial roofing technicians have the expertise to meet and exceed your expectations. Allow us to perform your commercial roof repair that will greatly extend the life of your existing roof. Give us a call for your commercial roof repair needs.